The French Socialist Party has declared Martine Aubry its new leader - with a greater margin than initially thought. A declaration of the winner was delayed when defeated rival Segolene Royal made accusations of voting irregularities, prompting a party investigation. But the party's national council has ratified last week's vote and said the margin increased from 42 votes to 102. The process has left the party deeply divided, with the French media speculating on a possible formal split. Speaking after being confirmed as leader, Ms Aubry said: "Let us rally, let us unite around a line of the left, but also around an upcoming renewal." Although Ms Aubry claimed victory last week, having won 50.02% in a second ballot of party members to Ms Royal's 49.98%, a commission was established on Monday to examine the accusations of irregularities. It not only dismissed Ms Royal's claims but also said the number of votes had increased. She had vowed to challenge the result in court. Ms Royal had also warned she will not accept validation of the poll by the national council, which reportedly has a pro-Aubry majority. However, following the council's decision, she too called on the party to "unite and re-group." 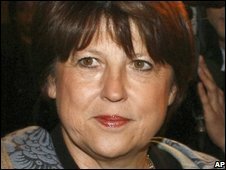 Ms Aubry, 58-year-old mayor of Lille and former employment minister, is the first woman to head the French Socialists and is best known as the architect of the 35-hour working week. She takes over from Francois Hollande, Ms Royal's estranged partner and the father of her four children. The leadership vote was put to 233,000 party members after the party congress - that was meant to back a single candidate - ended in disarray. The party has been beset by infighting since France's last Socialist President Francois Mitterrand stepped down in 1995. The UMP party of President Nicolas Sarkozy has revelled over what it calls "the implosion of the Socialist party". Correspondent Hugh Schofield in Paris says Ms Aubry's victory is no moment for celebration as the party remains divided after the debilitating battle.